Wayne Kahler (standing) welcomes Sen. Klobuchar (holding cup) to Kahler Automation. Sen. Klobuchar asks for details on Kahler Automation’s history, as Fairmont Mayor Debbie Foster (left) and others listen on. Wayne Kahler shares details of Kahler Automation’s operation as Chantill Kahler Royer, Sen. Klobuchar, and her staff listen. 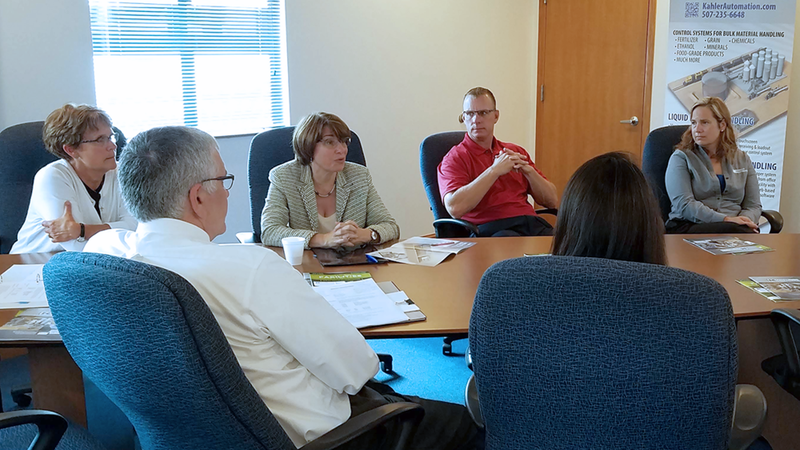 HMI Programmer Kristi Prafke begins to explain Kahler’s laser-guided, automated tripper control to Sen. Klobuchar. Wayne Kahler, Chantill Kahler Royer, and Mayor Foster look on as Kristi Prafke begins a demonstration for Sen. Klobuchar. Chantill Kahler Royer listens as Sen. Klobuchar asks Kristi Prafke about Kahler’s control systems. Engineer Paul Rehm begins to explain the elements of Kahler’s truck traffic control system to Sen. Klobuchar. Sen. Klobuchar asks Paul Rehm for examples of applications for Kahler’s truck traffic control system, as local media document the Senator’s visit. Production Supervisor Jordan Honnette greets Sen. Klobuchar as the tour reaches Kahler Automation’s production area. Wayne Kahler, Klobuchar southern Minnesota outreach director Chuck Ackman, Chantill Kahler Royer, and Mayor Foster look on as Jordan Honnette shows the Senator the inside of a control panel. Jordan Honnette explains the workings of a Kahler Automation high-speed tote filler to Sen. Klobuchar. Chantill Kahler Royer leads the tour group to the next station. Electrical Designer Cole Lightfoot describes the function of Kahler Automation’s motor control centers to Sen. Klobuchar. Cole Lightfoot explains to Sen. Klobuchar the inner workings of Kahler Automation control systems, as the rest of the tour group looks on. 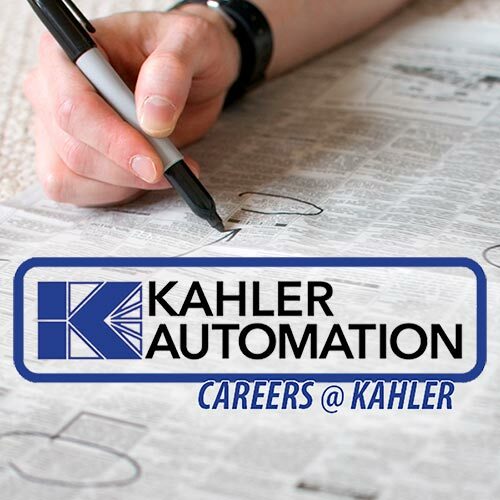 Service Coordinator Supervisor Jerome Niss shares his thoughts on the importance of technical support and service to Kahler Automation’s success. Wayne Kahler talks to Sen. Klobuchar about the role of aircraft, and rural airport infrastructure, in Kahler Automation’s business model. 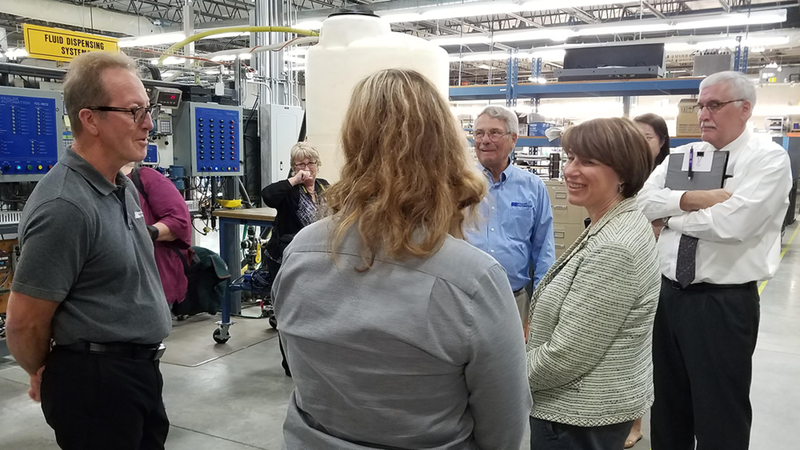 Sen. Klobuchar shares a light-hearted moment along the Kahler Automation tour. Lead Technical Support Specialist Phil Wakey (wearing headset) was one of many Kahler Automation employees that Sen. Klobuchar made a point to stop and chat with during the tour. As the tour wrapped up, Wayne Kahler and Sen. Klobuchar discussed the importance of rural broadband to the nation’s economic success. 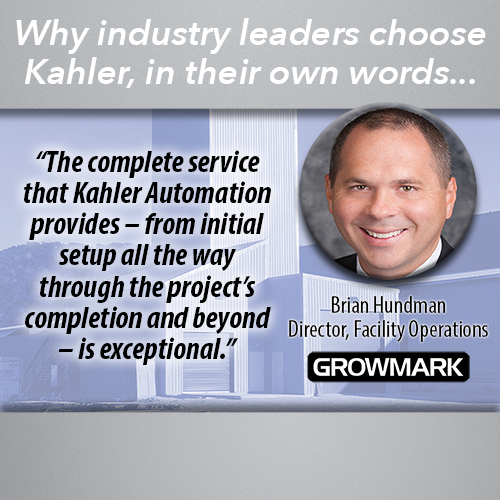 Mayor Foster shared very kind words about Kahler Automation’s place in the community, and credited Wayne Kahler for his leadership in Fairmont and Martin County. Wayne Kahler and Sen. Klobuchar listen as other members of the tour group shared some final thoughts as the Senator prepared to depart Kahler Automation. 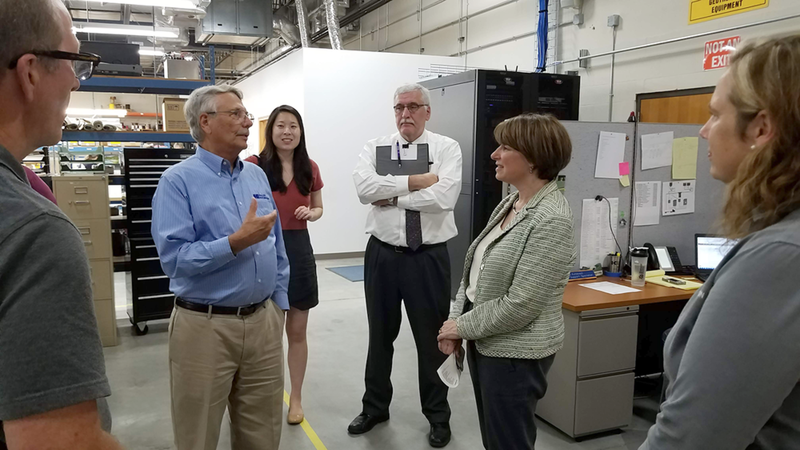 AUGUST 8, 2018 — Kahler Automation was honored to host U.S. Sen. Amy Klobuchar, D-Minn., on Wednesday as part of her annual visit to each of Minnesota's 87 counties. 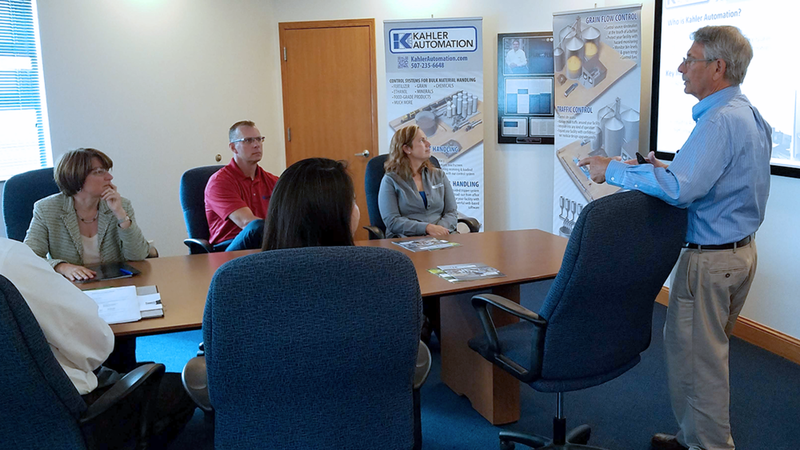 The Senator's tour of Kahler's Fairmont, Minn., facility began with a presentation by the company's founder and chairman, Wayne Kahler. After hearing a brief history of the company and explanation of bulk material handling control system technology, Klobuchar, her staff, Fairmont mayor Debbie Foster, and local media were led by CFO Chantill Kahler Royer around the facility. The first stop on the tour was a testing station where HMI Programmer Kristi Prafke demonstrated Kahler's laser-guided tripper control system and discussed interface design. Next was Engineer Paul Rehm who explained Kahler's various truck traffic control system components. The tour then moved to the production floor, where Production Supervisor Jordan Honnette showed the Senator some assemblies currently under construction, including a high-speed tote filler and a micro measurement system. Continuing on, Electrical Designer Cole Lightfoot described the function of Kahler's motor control centers, and the components within a standard control panel. The tour concluded with Service Coordinator Supervisor Jerome Niss sharing the importance of technical support & service to Kahler Automation's success — including the fleet of aircraft which allow technicians to get to sites quickly. In all, Klobuchar spent more than hour touring the facility, asking questions, and greeting employees. 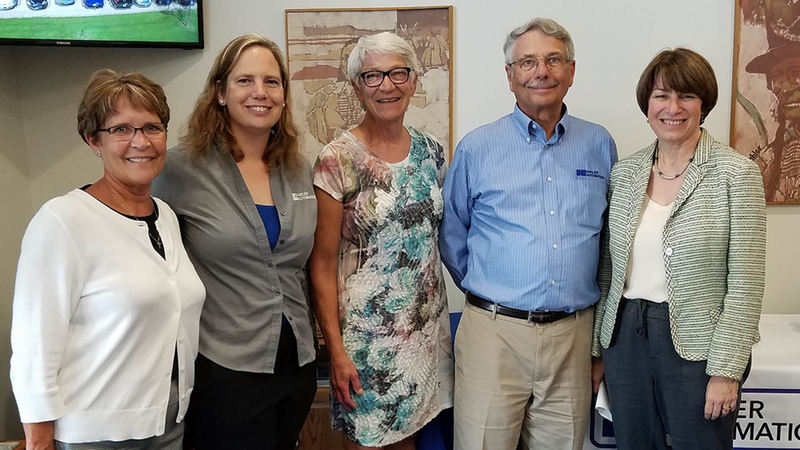 Wayne, Chantill, and everyone involved appreciated the Senator making time to visit Fairmont and learn more about technology & manufacturing in Southern Minnesota.